Virgin saying 2mb but getting 4mb download? Discussion in 'Virgin Media Broadband' started by blackdotline, Jan 18, 2008.
when i phoned the retention unit today to ask about adding XL TV to my M size phone and what i thought was 4mb bb the guy on the phone said i'm only on 2 mb. 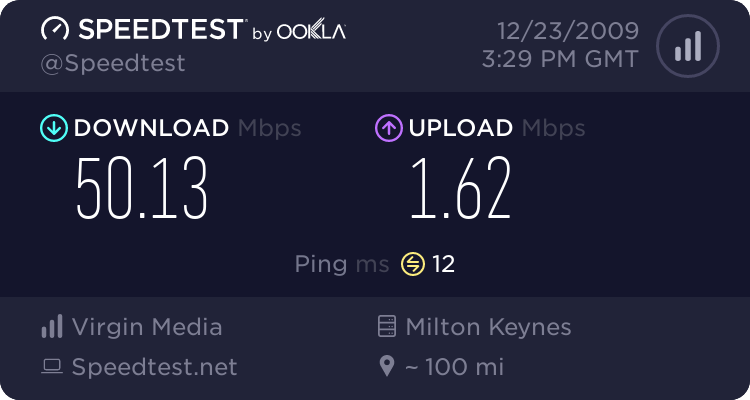 i've done various speed tests on the net over the last year and its always said about 3.7 or 3.9.
i'm worried that if i upgrade my package they might alter the broadband speed as there saying only gaurenteeing me 2mb? thanks for the rply. this is what i've tested my speed on before and it still says download is 3.9. i've double checked with virgin and they say i should def be on 2mb. when virgin add tv to my package do you know if it is done on a separate system (meaning bb should not be altered) or will i be knocked down to the 2mb bb they think i'm on. lucky you for getting faster!! if you have had telewest before they changed to virgin . just before they changed they up 2mb up to 4mb for the same price ... how long have you had it? i've had it for a couple of years, definitely since telewest ran it. i'm sure thats what happened thinking about it. they offered to up it to 4mb for free. how do i make virgin see that tho. i've rung through twice now and 2 people have said they think i'm on 2mb?